CosworthVega.com recently did a review of our Panhard Bars for the 1975-1980 GM H-Body in their latest edition of Cosworth Vega Magazine. You can read the article embedded below or click here to view it on their website. $499.00 or more = FREE GROUND SHIPPING! Read all of the details on our new shipping model at this link. Get all of our latest news, sales, coupon codes, technical articles, new products, “Deal of the Day“, videos, pictures and much more by following us on Google+. 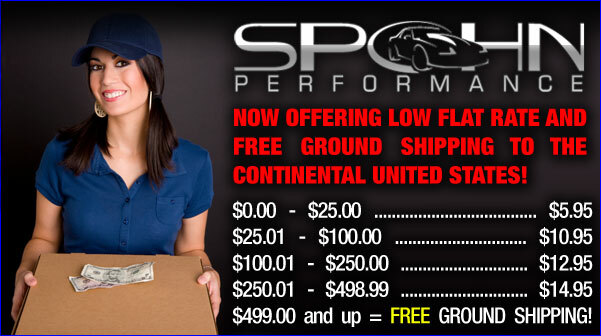 Creating an account and placing an order through Spohn Performance’s website at www.spohn.net just got a whole lot easier and FASTER! Those of you shopping on your smart phone through our mobile friendly website will especially appreciate this. With PayPal™ Access you can log on to our website with a click of the PayPal™ Access button. If you have a PayPal™ account, you log in with your existing PayPal™ credentials. Visitors without an existing PayPal™ account can register on the spot and realize all the benefits of being a PayPal™ member. Using PayPal™ Access means you can avoid the friction of creating a user account just for our site. Once authenticated, you must agree to share specific user attributes with our site, meaning you don’t have to re-enter information such as your email, password, phone number and address. Payment Method: Just because you log in using PayPal™ Access does NOT mean that you must pay using PayPal™ as your payment method. PayPal™ Access simply imports all of your information to our website so you do not have to create a website account and type in all of this information. When checking out through our website you will still be able to utilize any of the available payment methods. A little while ago we implemented a customer survey program on our www.spohn.net website through an independent third party, Shopper Approved. How it works: When a customer places an order through our website they are then presented with a survey to complete. Approximately 10 days later after the customer has received his or her order Shopper Approved emails them a follow up survey with additional questions on parts quality, shipping time, etc. All survey categories are ranked by the customer with 1-5 stars, with 5 being excellent and 1 being poor. Remember that this is all handled by an independent third party, Shopper Approved. We have no way to delete, edit, etc. any response that we don’t like. It is what it is, just like on eBay. On 09/15/2011 we hit the mark of 1,000 independent customer reviews and we thought we’d share the results with our current and future customers. 96.9% of our customers rated us with 4 or 5 stars, which qualified us for Shopper Approved’s 5 Star Excellence Award. Our ultimate goal is to have 100% 5 star reviews. The reality is that will probably never happen, but this tool lets us measure our progress and we’ll work hard to make sure we see even better numbers over the next 1,000 reviews we receive. You can click here to view our customer reviews on the Shopper Approved website.